Morgana featured the NEW BM500 for the first time at Graph Expo 2015. The NEW BM500 is capable of producing booklets up to 200 pages and is the first Morgana bookletmaker to incorporate the NEW Full-Color Touchscreen Interface. The NEW BM350, a similar platform producing booklets of up to 35 sheets, was also featured. The NEW high-capacity feeder, the VF602, previewed for the first time. This new vacuum feeder is equipped with a bar code reading system for variable data applications. Ideal for producing booklets with variable page counts and personalized information. The VF602 will be available for the NEW BM500 later this year. For additional information, visit us online at www.midstatelitho.net or contact us directly at 1-800-343-4231. This entry was posted in Vendor News and tagged BM350, BM500, Bookletmakers, Graph Expo 2015, Morgana, VF602 on September 14, 2015 by Billi Jean Johnstone. Visit Morgana in Booth #4013. Morgana will use the Graph Expo event to launch the DigiBook 200 in the US. The 200 was first shown at IPEX earlier this year, with units shipping in Europe since July. The DigiBook 200 perfect binder is suited to traditional and digital printers who require short to medium runs of PUR perfect bound books to a professional standard. The DigiBook 200 is equipped with a patented closed gluing system where the spine and side gluing is automatically applied by a slot applicator for the utmost binding quality and accuracy. This entry was posted in Special Events and tagged Graph Expo 2014, Morgana on September 29, 2014 by MSL. Visit Morgana in Booth #4013. Register for your VIP Demo today at Graph Expo! This entry was posted in Special Events and tagged Graph Expo, Morgana on September 25, 2014 by MSL. Morgana – Solutions for fast and flexible finishing. Morgana Systems USA will have a strong presence at Graph Expo 14 where the product range will be significantly enhanced and expanded following the recent acquisition by Plockmatic. Visit Morgana in Booth #4014 at Graph Expo! 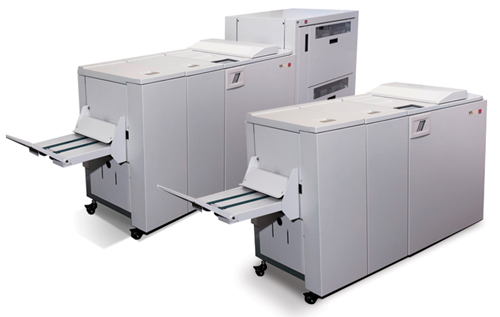 System 2000S with its high capacity dual bin feeder offers a flexible solution for a wide range of booklet types and sizes. The AF602 air assisted feeder has a capacity up to 21″. Pre-collated sets can be placed into both bins or covers can be placed into one of the bins when they need to be merged with collated sets.The heavy duty booklet making section comes complete with stitching heads and the Morgana Squarefold to give a professional perfect bound effect to the book. Morgana will be showing several machines from their Pro range of creasers and folders, all controlled with the SmartScreen touchscreen. The market leading AutoCreaser 33 will be shown with the latest software which includes an application specifically designed for perfect bound cover production. 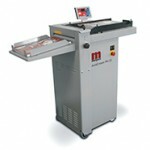 The larger sized AutoCreaser Pro 50 will be running with the AutoFold Pro inline folding unit. The AutoFold Pro can be added to any existing Morgana creaser- or to other manufacturers creasing machines. The DigiFold Pro creaser/folder will be on show and continues to be the market leader in class, offering unrivaled production in terms of quality and accuracy. This machine can crease and fold stock up to 0.015″ thick without cracking the toner or stock surface. The new DigiBook 200 PUR Binder, equipped with a patented closed gluing system where the spine and side gluing is accurately applied by a slot applicator. Up to 200 books per hour, and up to 2″ thick, with automatic block measuring, clamp setting and nozzle adjustment. CardXtra Plus Automate many of your finishing tasks in this one versatile cutting and creasing unit. 250 business cards can be finished in less than 2 minutes. A small job such as this would previously have needed 18 cuts on a cutter can now be offered as a “while you wait” service. In addition to the extensive range of offline and near line solutions from Morgana USA, their parent company, Plockmatic will have a strong representation at the show with their wide range of inline solutions. This entry was posted in Special Events and tagged Graph Expo, Morgana on September 24, 2014 by MSL. A complete new range of bookletmakers will take center stage, including the System 2000S—a product that is capable of producing booklets of up to 120 pages. The system will be fed by the ACF510, a hybrid feeder capable of feeding pre-collated sets from a digital print engine, collating litho printed sections, or indeed combining both into a finished book product. The heavy-duty bookletmaking section comes complete with wire stitching heads, fore-edge trimmer, and the Morgana Squarefold 2000 to give a professional perfect bound effect to the finished product. The System 2000S will be shown with the optional CST unit. This unit can edge-trim the sheets before the bookletmaking section, meaning the work can be taken straight from the press to the finishing unit with no need to trim the edges on a guillotine. This helps to make the whole process much more streamlined. The CST comes complete with a creasing mechanism helping to eliminate cracking on digital print or cross grained cover stock. 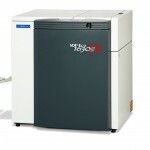 Another significant debut on the Morgana stand will be the U.S. launch of the DigiBook 300 PUR perfect binding machine. The unit can produce up to 300 8.5×11″ books per hour. A patented solution controls the application of the PUR glue with a sealed nozzle system. This makes DigiBook 300 extremely quick and effective to set-up and shut down—ideal for very short runs of PUR bound books, as often required in the digital printing world. The machine will be shown producing a wide range of digitally printed and litho printed jobs on coated stock, and will be shown producing book blocks with end-papers ready for casing into hard-cover books. In addition to these launches, Morgana will be showing several machines from their Pro range of creasers and folders, all controlled with SmartScreen touchscreen software. The market leading AutoCreaser Pro 33 will be shown with the latest software incorporating an application specifically designed for perfect bound cover production. It is also available with an option of side-stop perforating, ideal for applications such as draw tickets or tear-off vouchers. 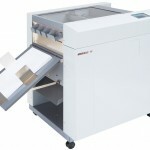 The larger format AutoCreaser Pro 50 will be running with the AutoFold in-line folding unit. 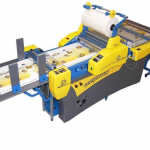 AutoFold can be added to any existing Morgana creaser, or creasing equipment supplied by other manufacturers. The market leading DigiFold Pro creaser/folder will be on display offering unrivalled production in terms of quality and accuracy. This machine can crease and fold stock up to 0.015″ thick without cracking the toner or stock surface. A wide range of folds can be simply selected by touching the fold icon and entering the paper size—the machine then takes care of the remaining set-up automatically. In addition to the extensive range of off-line and near-line solutions from Morgana USA, its parent company Plockmatic will have strong representation at the show with a wide range of in-line solutions. Bookletmaking systems will be shown in the Ricoh and Xerox booths producing a wide range of booklets, including options for full-bleed trimming and Squarefold production. This entry was posted in Special Events, Vendor News and tagged Morgana, PUR Binding on September 19, 2014 by MSL. Register today for your Free Graph Expo attendee badge! Morgana Systems Ltd, the UK’s leading manufacturer of equipment for digital finishing, has announced details of its exhibit for GRAPH EXPO 2014. The company can be found at booth #4013, close to its major customer base, the digital print engine manufacturers. Morgana Systems USA will have a strong presence at the show where the product range will be significantly enhanced with latest product introductions in heavy duty bookletmaking and a brand new addition to the PUR binding range. Product on show at the event will include the latest version of the System 2000S bookletmaker, featuring the high capacity dual bin feeder offering a flexible solution for a wide range of booklet types and sizes. The AF602 air assisted feeder has a capacity of up to 21″. Pre-collated sets can be placed into both bins or covers can be placed into one bin when they need to be merged with collated sets. The heavy-duty bookletmaking section comes complete with stitching heads and the unique Morgana Squarefold to give a professional perfect bound effect to the book. Making its show debut in the US, the new DigiBook 200 PUR Binder is equipped with a patented closed gluing system where the spine and side gluing is accurately applied by a slot applicator. The DigiBook 200 provides up to 200 books per hour, and up to 2″ thick, with automatic block measuring, clamp setting and nozzle adjustment. Morgana will be showing several machines from their Pro range of creasers and folders, all controlled with the SmartScreen touchscreen. The market leading AutoCreaser 33 will be shown with the latest software, which includes an application specifically designed for perfect bound cover production. 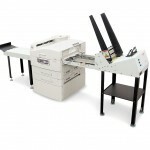 The larger sized AutoCreaser Pro 50 will be running with the AutoFold Pro inline folding unit. The AutoFold Pro can be added to any existing Morgana creaser or to other manufacturers creasing machines. The DigiFold Pro creaser/folder will be on show and continues to be the market leader in class, offering unrivalled production in terms of quality and accuracy. This machine can crease and fold stock up to 0.015″ thick without cracking the toner or stock surface. 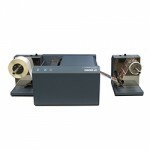 CardXtra Plus automates many of finishing tasks in this one versatile cutting and creasing unit. 250 business cards can be finished in less than 2 minutes. A small job such as this would previously have needed 18 cuts on a guillotine, but can now be offered as a “while you wait” service. In addition to the extensive range of offline and near line solutions from Morgana USA, parent company Plockmatic will also have a strong representation at the show with its wide range of inline solutions. This entry was posted in Vendor News and tagged Graph Expo 2014, Morgana on September 10, 2014 by MSL. Morgana will use Ipex to unveil the next generation models of its DigiFold Pro and Autocreaser Pro machines. At 6,000 A4 sph the new DigiFold Pro-500 is no faster than its Ipex 2010-launched third generation predecessor, however it incorporates key changes such as a high capacity vacuum top feed that can take sheet piles of up to 500mm compared to just 60mm. The device handles paper stocks up to 400gsm. Other new features include dual creasing blades, which can be set for up or down creasing profiles as well as different creasing thickness and automatic set up of folding rollers, previously set manually. Meanwhile the new AutoCreaser Pro-500, which also features a new high capacity vacuum top feeder, will be launched at Ipex as well. The 8,500sph device incorporates dual creasing blades and matrix rather than the single blade of its predecessor, meaning users don’t need to change blades for different stocks. Additionally two different profiles for hinge and spine creasing can now be selected, which Hillhouse said would particularly appeal to those doing perfect binding work. “Before, the sheets had to go through the machine in two passes, but now people can produce covers for perfect binding with the two different profiles of crease in a single pass,” said Hillhouse. “Traditionally customers have been digital print shops but that is changing because most big litho printers now have a digital section. These are heavier duty machines and we see them fitting with higher volume customers,” he added. The units, which will be marketed at the top end of the DigiFold and AutoCreaser range, will be available to order at Ipex, with first shipping from Morgana’s Milton Keynes manufacturing site expected in June. Prices have yet to be finalized. This entry was posted in Vendor News and tagged AutoCreaser Pro, autocreaser pro 500, digipro, digipro 500, Ipex, launches, Morgana, pro series on March 24, 2014 by MSL.